We’d love your help. Let us know what’s wrong with this preview of Petey by Ben Mikaelsen. A critically-acclaimed novel that explores the world of a man bound by cerebral palsy -- now in paperback. To ask other readers questions about Petey, please sign up. on page 139, the click clack of the train sounded a little familiar to petey. why? My 4th grade son's class read this together. He came home talking about it. And then, luckily, they got to have a phone interview with the author! As he learned more about the back story of Petey from the author, he came to love the book even more. One day while we were in the library, he insisted that we check the book out so I could read it too. I agreed and we brought it home. Technically, it wasn't a difficult book to read, but it was hard.... emotionally. Maybe more so because I'm a mother. My 4th grade son's class read this together. He came home talking about it. And then, luckily, they got to have a phone interview with the author! As he learned more about the back story of Petey from the author, he came to love the book even more. One day while we were in the library, he insisted that we check the book out so I could read it too. I agreed and we brought it home. Technically, it wasn't a difficult book to read, but it was hard.... emotionally. Maybe more so because I'm a mother. I cried as Petey's mother, who had done everything she could for her son, put him on a train and into the State's care. I cried as Petey tried to reach out from his bodily prison, trying to show the people around him he wasn't really an "idiot". I rejoiced as he made small advances, and I wished with all my heart that he had been born in a different time where he could have gotten the help and therapy he needed. I read the book in a day and a half, my son asking my constantly, "How do you like it, Mom?" Ben Mikaelsen does not possess the talent to be writing a book about cerebral palsy. His words are clumsy and pedestrian, his characters are paper dolls, his pacing is non-existent, and his sense of plot is amateur at best. Most of Petey centers around the titular character, who suffers from cerebral palsy, and the people who enter his life only to abandon him a couple chapters later. Is this Mikaelsen's Big Message? Humans Are Uncomfortable And More Than Willing To Ditch People Who Aren't Perfe Ben Mikaelsen does not possess the talent to be writing a book about cerebral palsy. His words are clumsy and pedestrian, his characters are paper dolls, his pacing is non-existent, and his sense of plot is amateur at best. Most of Petey centers around the titular character, who suffers from cerebral palsy, and the people who enter his life only to abandon him a couple chapters later. Is this Mikaelsen's Big Message? Humans Are Uncomfortable And More Than Willing To Ditch People Who Aren't Perfect? What's this, though? A 12 year-old befriends a 70 year-old Petey and makes strident, unbelievable changes in the man's final months on earth? Heartwarming! A triumph of the spirit! A parable for the ages! Well, no. Not at all. Petey is a mess of a book. A sloppy, drippy mess of a book. One that aims for aching, powerful themes, but can barely cobble together anything more than navel-gazing, made-for-TV-movie shmaltz. Out there is an author who will do justice to the topic, one who will illuminate the lives of those afflicted with the condition. But that author's name is not Ben Mikaelsen. I'm not a cynic, though. Young readers would be far better serviced with books like Al Capone Does My Shirts, Do You Remember The Color Blue?, Joey Pigza Swallowed The Key, and Rules. In 1920, Petey is born with Cerebral Palsy. After his parents drained their savings trying to treat him, Petey is given to the state, where he grows up in a state mental institution. Since he cannot speak, he is considered an idiot, but Petey can hear, think, and feel. As time goes by, Petey learns to communicate and makes friends along the way, but through various circumstances beyond his control, he is always alone in the end. In the second part of the book, Petey is an old man, and he hasn’t In 1920, Petey is born with Cerebral Palsy. After his parents drained their savings trying to treat him, Petey is given to the state, where he grows up in a state mental institution. Since he cannot speak, he is considered an idiot, but Petey can hear, think, and feel. As time goes by, Petey learns to communicate and makes friends along the way, but through various circumstances beyond his control, he is always alone in the end. In the second part of the book, Petey is an old man, and he hasn’t ignored his lifelong desire for friendship and family. When he meets a young teen, Petey thinks that maybe this is his final chance for all he has ever wanted. "Mücevher, nasıl parlayacağını keşfeden bir kaya parçasıdır..."
Engelli vücudunun içine hapsolmuş biri nasıl mutlu olmayı böyle güzel başarabilir? Petey'i özel yapan neydi? Hayat ona adil davranmadı ama o, asla sahip olduklarından fazlasını istemedi. Çünkü imkansız görünse de onun yaşamı, hayattan zevk almak üzerine kurulmuştu... Ben çok etkilenmiştim bu kitaptaki gerçek yaşanmış hayat hikayesinden. Farelerle bile dost olabilmiş bu yüce yürekten çok ders öğrenmiştim... o çıkardığım dersler , uzun "Mücevher, nasıl parlayacağını keşfeden bir kaya parçasıdır..."
Wow! What a powerful read! I bought this book, kind of by accident. I bought a set of audiobooks and received Petey as a bonus audiobook. I wanted my students to read along as they listen so I needed a hard copy. Both audiobook and hard copy have sat on the shelves for two years. The book is highly recommended so I needed to read it so I could hard sell it to my students. I read it in less than a day. I couldn't put it down. Sometimes it's hard to realize how recently we stigmatized physical disabi Wow! What a powerful read! Sometimes it's hard to realize how recently we stigmatized physical disabilities as strongly as depicted in this book. To be labeled "an idiot" and placed in an insane asylum just because of a physical disability is incredible to our modern sensibilities. What does physical disability have to do with insanity? Especially at such a young age as Petey--2 years old. For that matter, why would an insane asylum have an infant ward at all? The neglect suffered by the inmates, the suffering of the patients, the constant dissatisfaction... what an awful life to lead. People appearing and disappearing for no reason. Visits by the public as if the asylum were some kind of zoo. Petey is trapped in his body as a cerebral palsy patient and, as a result, in the asylum. I wonder what happened to his family who had to give him up because he was too much work and too expensive for them to keep. I wonder what happened to the only female love in his life. I wonder how he stayed sane in such an insane environment. I wonder how anyone survived the insanity. I honestly can only think of a few books that truly changed my life. Petey was certainly one of those. I first read the book as a child and can even remember the moment I took it off the shelf. Among other things, Petey is a profound meditation on joy, love and our search for meaning. As someone with CP, Petey was one of the first books I really related to. And for that reason, and so many others, Petey will always have a special place in my heart. I learned that you should never ever judge someone by how they look. Just because a person is disabled doesn't mean they're idiotic! I recommend this to people who like reading books about someone and how they grow up. So basically I recommend this to people who like reading about someone and who like crying while reading the book and laughing while reading it. My mom brought me home a (signed!) copy of this book after meeting the author. I thought it sounded fantastic and was excited to pick it up. I’ve read one other Ben Mikaelson book, Touching Spirit Bear, and for the most part I enjoyed it, but I did have to read it for school and do about a thousand projects related to it, which definitely took away from the enjoyment. However, that’s not the book we’re talking about right now. So, Petey. Overall, I liked it. It was definitely middle grade, which My mom brought me home a (signed!) copy of this book after meeting the author. I thought it sounded fantastic and was excited to pick it up. I’ve read one other Ben Mikaelson book, Touching Spirit Bear, and for the most part I enjoyed it, but I did have to read it for school and do about a thousand projects related to it, which definitely took away from the enjoyment. However, that’s not the book we’re talking about right now. So, Petey. Overall, I liked it. It was definitely middle grade, which isn’t necessarily a bad thing, it was just a very prominent thing. The plot wasn’t too complex and there weren’t any huge surprises (to the point where the synopsis was almost a summary), but it was still a fun read. For the most part, I liked the characters, Petey’s best friend Calvin having to be my favorite. I did have some issues with Trevor. He didn’t read like a “young teen” at all. He was incredibly indecisive and extremely moody. It seemed like every other page he was getting really, really mad about something out of the blue and then feeling guilty about it. I did like how much we got to know Petey. You would think that the beginning of this book would open with Trevor and then we would get to know Petey’s backstory over time, but we really follow Petey throughout the years. By the end of the book, readers of this book will catch on to Peter’s diction and know what he’s saying even before it is translated for you. It was quite a sad story, as you would expect after the synopsis tells about how Petey lost friends over and over again. However, the ending of this book didn’t break my heart like I thought it would. I think it’s because everything wrapped up so perfectly. Literally every lose end was tied and everyone who could’ve been considered an antagonist joined the good side. It was all a little too perfect. The overall message, however, was a great one. All in all, this was a fun book that I think would appeal to middle grade readers. It wasn’t one of those middle grade books (like Percy Jackson and Harry Potter) that I think is completely necessary to read or as enjoyable to read as a young adult or adult, but I don’t regret reading it. It was a quick read that helped get me out of a reading slump and I know that my younger cousins will really enjoy it next! Such a heartwarming story about a man named Petey who suffers from severe cerebral palsy, and the lives he touches along his own journey through life. This book is based on a true story. The audiobook included an interview with the author, where he explained his own interactions with the real life Petey. I will definitely recommend this book to my 4th and 5th grade boys! Kitaplığımda uzun süreden beri bekliyordu kitap , okuduktan sonra bu kadar süre beklettiğim için kendime kızdım . YAzım dili ve konu harikaydı. Özellikle yazılanların %90 ının gerçek olduğunu bilmek daha da etkiledi beni. I am so glad I finally finished this book. Living in Montana and growing up working with people who have disabilities this story spoke to me. The story is about a young man misdiagnosed in the 20s and sent to Warm Springs, when his family became unable to care for him. I lived thirty minute from Warm Springs and knew many adults who had been sent into Helena from the facility as it closed down. The story was kind, respectful, and most importantly real. This is a great story, I am glad I read it. I've read this twice and cried both times. This books is about the indomitable human spirit and the true nature of friendship. This was a really unforgettable story, well-written and offering a new point of view and excellent imagery and character development to support it. Petey’nin ağzından “Nassss?” kelimesi çıktı. Petey, gülümsemedi. Ciddi olup olmadığını anlamak için Trevor’ın gözlerine baktı. “Büü baaa,” dedi belli belirsiz. The book Petey by Ben Mikaelsen is about a boy named Petey Corbin who was born with cerebral palsy. His mother struggles to help care for his health. She was unwilling to places Petey’s in an asylum, but she had to. There he was labeled as an idiot and was ignored by the people around him. A young resident named Calvin Anders arrives in Petey’s room at the hospital one day. He then took the time and learns to understand Petey’s garbled sound which leads him to become Petey’s spokesman and best f The book Petey by Ben Mikaelsen is about a boy named Petey Corbin who was born with cerebral palsy. His mother struggles to help care for his health. She was unwilling to places Petey’s in an asylum, but she had to. There he was labeled as an idiot and was ignored by the people around him. A young resident named Calvin Anders arrives in Petey’s room at the hospital one day. He then took the time and learns to understand Petey’s garbled sound which leads him to become Petey’s spokesman and best friend. A few years later they were separated when Petey moved out of the hospital and into a nursing home. Along now all Petey’s wonder is will he ever find another person that understand him like Calvin. I think the book was pretty good. I read it when I was in fifth grade, and now I have different feelings about it. I guess I didn't understand the real meaning of it in fifth grade which for the most part makes sense. The reason why I only gave it four stars instead of five was because I feel as though the beginning wastes to much time. I understand that it's meant to lead you into the story, but I think that the author definitely could've made it shorter. i think the theme for this book was no matter how different people look we are all the same because Petey was a baby and everyone thought he was an ugly baby and the mother shouldn't wasnt her time. but when petey grew up he was able to say so words which was a huge progress change for him !!! An important book. I read this with my 8th grade daughter in our mother-daughter book club. I'm so glad she read it. I'm so glad I read it, too. Hopefully we will carry it with us and let it inspire us to make the world a tiny bit better. Choked up at the end— the last two sentences! Good story! Don't get me wrong about the two stars I gave this book; there are parts of it that I'd highly recommend to readers. However, there's also a reason, several reasons in fact, for the two stars. First I'll start out with the positive points. 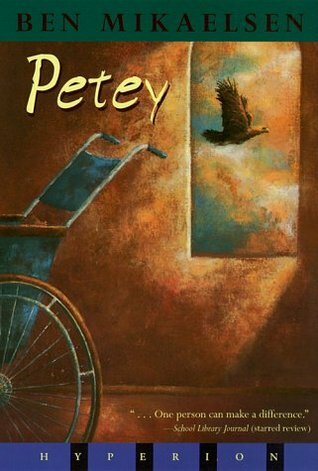 Petey is the story of a boy born with Cerebral Palsy, a symptom acquired before birth, during birth, or shortly after birth, as referenced from the "author's note" at the end of the book. Cerebral Palsy distorts a person's physical attributes, and sometimes a p Don't get me wrong about the two stars I gave this book; there are parts of it that I'd highly recommend to readers. However, there's also a reason, several reasons in fact, for the two stars. First I'll start out with the positive points. Petey is the story of a boy born with Cerebral Palsy, a symptom acquired before birth, during birth, or shortly after birth, as referenced from the "author's note" at the end of the book. Cerebral Palsy distorts a person's physical attributes, and sometimes a person's mind. For Petey, he has a fully-functional brain, with a very distorted body. Throughout the book he is seemingly trapped inside a body that can't do anything for itself, and most people regard him as "stupid" - as in the medical term for "mentally disfunctional." It is this theme that carries the entire story, and it's important that people understand that "disfunctional" people are not all mindless. It also gives us reason to be thankful for our good health, and fully-working bodies. Petey meets several people who come to know his real mind, his real personality. He manages to make many friends, and they become the lights in his darkened world; but as each friendship is formed, it eventually gets broken as the other person has to move on with life for various reasons. Was that a spoiler? I wouldn't say so, as it happens very often throughout the first part of the book. You expect it after the first person's unexpected leaving. ...and so we come to my critique of the book. While still in the first part of the story, I started to think, "What is the plot of this book?" The answer? There isn't really one. Is that a bad thing? Of course not - it made me think of biographies, where a lot of things happen, yet there is no clear goal in mind. That's perfectly fine. You could say that Petey's purpose is to "change lives." Still, I couldn't help but often feel that the story was going nowhere - especially knowing that this wasn't a biography, and a piece of fiction based off thoughts and research. (Well, that's sort of a biography as well, but you get the picture). One of the first pages in Petey features a Bible verse, something I was happily surprised with. Considering this book was published by Hyperion, a Disney-owned publisher, I didn't expect to see that. Well, this isn't a big spoiler either when I mention that there were further Biblical verses sprinkled throughout the book. It added an interesting touch, especially when you have a character that has so little to enjoy in this life, and desires a new body. That's a beautiful theme. However, that's all there really was. Bible verses. The author didn't go any further than that, or at least whatever was there was edited out. It would have been such a wonderful ending to have Petey introduced to a loving savior, who in the next world would reward him with a new body. Only a couple minor references to "church" are mentioned, not much more. It seemed to me that the author was just beating around the bush by inserting those Bible verses. Why put them in if you're not actually going to go deeper than that? Put them to use? In the end, I would have just left them out. They add a special touch to the story - but nothing more. The second part of this book was what reminded me that I was reading a "children's" book. It's also what the description on the back of the book is on. The first part was really quite nice, and I expected the same from the second part - but that was not the case. Petey is definetly my #1 book! It was so sad, but thats why I think it was one of those books that was intreging to just keep reading and reading. My favorite part of the book was when Petey was getting picked on and Trevor stepped in and started beating up the guy. That was a heart warming moment. I would recommend this book to anyone who loves to cry and people who love drama books. Again Petey was a great book and I would recommend it to anybody! In the 1920s, at a hospital in Bozeman, Montana, a boy named Petey is born. The mother and her husband spend two years and lots of money to find a doctor who can give them good news, but all diagnose their son as an idiot. The Corbins reluctantly let Petey go to the Insane Asylum in Warm Springs, Montana. We later find out that he was misdiagnosed and probably has cerebal palsy. The story then switches its point of view to following Petey's life in the asylum. Crowded, unsanitary, and terrible, In the 1920s, at a hospital in Bozeman, Montana, a boy named Petey is born. The mother and her husband spend two years and lots of money to find a doctor who can give them good news, but all diagnose their son as an idiot. The Corbins reluctantly let Petey go to the Insane Asylum in Warm Springs, Montana. We later find out that he was misdiagnosed and probably has cerebal palsy. The story then switches its point of view to following Petey's life in the asylum. Crowded, unsanitary, and terrible, the institution appears awful to Petey. When nurses care for him, they do it lazily and improperly. A male nurse named Esteban begins to work at the institution and quickly befriends Petey. Whenever he can, Esteban talks to Petey and brings him chocolate, as Petey is "his favorite". Esteban understands (unlike most people) that Petey is not an idiot and that it is just his body that is different. Esteban believed that Petey could think like anyone else, but that he was trapped in his twisted body. At the age of 11, Petey is transferred into the Men's Ward. Calvin, moves into Petey's room. Mildly retarded, and club-footed, Calvin quickly becomes Petey's best friend, and the two spend all their time together. Calvin teaches Petey to mouth a few words through various means are able to communicate with each other. He develops other friendships with people that work at the asylum and care for him like Joe and Cassie. But there are long periods of loneliness and despair in between. Petey and Calvin then meet Owen twenty years later. Both men are around forty years old when Owen befriends them. But he soon leaves because he is too old. Cut to part two which takes place many years later in 1990. Petey is now around seventy years old and living in a nursing home in his hometown of Bozeman, Montana. He is constantly tormented by local teenagers who often pelt him with snowballs because he is disabled. A kind boy named Trevor Ladd witnesses one of these attacks and intervenes, eventually befriending him. A remarkable friendship builds between the two that teaches Trevor about trust, dignity, respect, growth, understanding, wisdom and love that ultimately make Trevor appreciate life more. The story is based on a real life story of a patient with cerebral palsy and is an amazing story that makes you smile and cry at the same time.